This Porsche is a reconstruction of a Porsche 911 ST from 1970/1971 using a Porsche 964 for the basic structure. These vehicles used to be so successful in GT sport that they were able to achieve overall victories in international competitions. This was due, amongst other things, to the performance-enhanced engine variant with approx. 250 hp and a slightly wider body so that 7-inch and 8-inch wheel rims could be used. In combination with a simplified body, a more firmly tuned chassis, a wider track, greater overrun, broader shock absorbers and lighter interior fittings, these changes not only enabled improved acceleration and better braking performance but also delivered a very balanced driving performance overall. Of course, vehicles of this type were not yet fitted at the time with the comfort features of the late 1980s and 1990s such as ABS or power steering but were equipped instead in a comparatively puristic manner. At the beginning of the 1990s, Porsche developed a vehicle in the form of the 964 model that still had the attraction of an air-cooled engine combined with a modified transmission but was at the same time also equipped with a modern McPherson chassis. Very precise power steering and an ABS braking system were also used here for the first time. 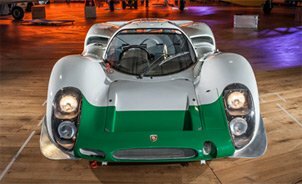 In addition, the semi-trailing arms on the rear axle were modified and their shortened lever arms had more in common with the configuration of the Porsche GT sports cars of the 1970s and 1980s such as the RSR and the 935 or 930 Turbos. However, this model was accompanied by an enormous increase in weight. While fully equipped vehicles built in 1971, such as a 911 S, still weighed 1,025 kg and the lighter ST versions even as little as 860 kg, the Porsche 964 models already weighed 1,350 kg. At the same time, these models were fitted with an engine with a displacement of 3.6 litres and thus achieved an output of 250 hp at just 6,100 rpm. Overall, this vehicle was very harmonious to drive with enormous torque of 310 Nm at just 4,800 rpm. If we summarise the key data, the base engine from the 964 already delivered the performance achieved by the race versions of the former 911 ST models after tuning in the workshop. Due to the higher displacement of 3.6 litres instead of 2.5 litres, these engines are extremely dynamic and mobile, as well as being very agile when accelerating from low speeds. The aim of the company PS Automobile GmbH was to combine the advantages of both vehicle series. The goal was to transport the outstanding components from the air-cooled Porsche 964 with its advanced technology back to the look of the 1970s. In the process, the aim was to recreate almost 100 per cent of the details of a Porsche 911 ST from the year 1971. The result was a unique vehicle model that combined the look of the 911 ST with the great technological leap in the 1990s in a particularly innovative way. All of the measures carried out led to a reduction in weight of approx. 170 kg so that the total weight of the vehicle was only 1,230 kg (original 1,400 kg). In combination with the improved performance data and the optimisation of the chassis, our 911 ST offers a unique driving experience with the possibility of year-round use. All of the vehicles selected as the basic structure for the reconstructions have a sunroof (available optionally without a sunroof), automatic seat belts at front and rear and a passenger airbag. A driver airbag is possible after replacing the Nardi sport steering wheel. The VAT is included for this vehicle. The final price of the vehicle depends on the options chosen. If you are interested, we would be delighted to send you more information.